In the initial few months after my father’s death I was in a haze of grief. The remainder of winter and early Spring were spent dazed, going through the motions of daily life on automatic pilot. It was the Catholic priest, Father Lynch, who consoled me. My father’s Protestant Church community did not. They stayed away in droves. I remember only one evangelical Anglican minister who was a wonderful support to my mother and for that I was grateful. It was the Catholic community that embraced me — as much as I would allow myself to be embraced. My sorrow was too raw for public viewing. I cringed at any sign of Christ-like embraces; they reminded me of my father and he was gone forever. There was no way to bring him back. I had loved him since the dawn of my memory and now he was gone. Embraces were empty promises of the one embrace I could not have. Embraces only made the pain sharper and the black hole in my heart seem deeper and blacker. Embraces were a cruel reminder me of how lonesome each day would end. On Victoria Day weekend of 1970, it was time to return to the lake and prepare the cottage for another summer. It was torture. Everything reminded me of dad: His fishing rod hanging in the tool-shed, his shoes sitting in the cabin just as he left them the previous autumn, a book left open on the arm of his chair. It was heartbreaking. My brother and I put the pier and boat hoist into the lake for another summer. Late in the afternoon, I took the boat alone out on the lake and into a small, secluded cove where Dad and I often fished. The water was cold, clear and still. The previous year’s dead brushes lined the shore. Birds could be heard in the trees around the cove. The world was awakening to Spring. A few days later I received an unexpected telephone call from my childhood sweetheart, LaRee that would change the course of my life. She called to express her condolences about Dad’s death. I wanted to see her and asked her to come west to see her grandparents (yeah, right). LaRee had been living in eastern Canada for a number of years, although many summers were spent visiting her grandparents who still lived next door to my family in western Canada. That telephone call began a passionate love affair that has lasted more than thirty-eight years! We fell madly in love during the summer of 1970 while she was ostensibly visiting her grandparents. In 1971, LaRee moved to western Canada and lived with her grandparents. Our hormones and passion got the best of us and LaRee became pregnant with our child. I didn’t want the baby and started to pressure her to have an abortion. LaRee did not want to have an abortion. She wanted to get married and raise our baby. Not me. I wanted to party with my friends. A baby would stifle my fun, so I intensified the pressure on LaRee to have an abortion. Things turned against LaRee and her desire to have the baby. Conventional wisdom of the day maintained that an unwed mother’s life was ruined; her future would be spent on welfare, or so the clairvoyants of conventional wisdom told her. It was contrived and unnecessary. Every generation has its cruel gossips and ours began to prattle. LaRee was pregnant and friendless. Her only friend was her lover. He was me, and I wanted our baby gone. The option of adoption was out of the question (or so we thought) because that would involve the embarrassment of local townsfolk seeing my girlfriend visibly pregnant. They would talk. And what if LaRee chose to keep the baby?! People would judge me as a cad, a deadbeat dad—especially after I had been blessed with such a wonderful father. Don’t get me wrong, I wanted to be a Dad someday, but not yet. There were parties to be had, songs to be sung, drinks to be drunk, opportunities to be explored. A child would, well, cramp my style. With each passing day of pregnancy I intensified the pressure on LaRee to have an abortion. Quite simply, the baby had to die. Of course, I didn’t couch the reality of abortion in such brutally honest terms. To recognize the developing baby’s humanity would have been counterproductive to my goal of abortion (pardon the dreadful pun). The eyeless “I” beckoned. I withdrew emotionally from LaRee. I refused to acknowledge the humanity of the new life within her. Phrases like blobs of tissue and potential life crept into my vocabulary. But in my heart of hearts I didn’t believe my own words. My problem was that the eyeless “I” saw. You see, my father kept the complete set TimeLife Book series in his bookcase. One book in that series was entitled Growth. It was published in 1965 and contained Swedish photographer Lennart Nilsson’s very early prenatal photography dating back to 1957. 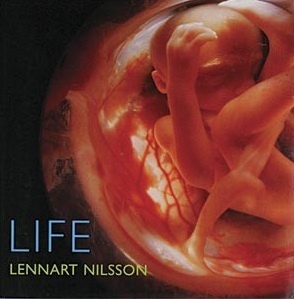 Nilsson used an endoscope, and other methods, to capture imagery of life developing within the womb. His photographs originally were made famous in a book entitled A Child is Born, but they also appeared in our TimeLife book. Nilsson’s full-color images took the reader on the prenatal journey beginning at four weeks after conception through the continuum of development to birth. When the book first arrived in the mail during the mid-1960s, my family sat around the kitchen table and marveled at the photography. It was stunning! At the age of twelve or thirteen I learned about the very real humanity of prenatal life—years before LaRee’s pregnancy. My eyes had seen. My conscience knew. All I needed to do was stop the emotional abandonment of LaRee and stand beside her and our baby. No, the abandonment continued. LaRee’s sadly capitulated and her grandmother made the arrangements for an abortion. In the weeks that preceded the Christmas Season of 1971, LaRee laid on an abortionist’s table and our baby was sucked from her and swept away like biomedical waste. That decision changed us both forever. The images in that TimeLife book haunted me. Within a few months of the abortion, I began having a recurring nightmare with Munch-like characters and phantoms. It terrorized my sleep for close to a year. In this nightmare, I found myself walking through a park at night in thick fog. Suddenly, I would hear the sound my father’s distinctive singular cough somewhere in the mist, just out of sight. I’d call to him and quicken my pace through the fog in the general direction I heard the cough. Wisps of ghostly images would appear in the mist then dissipate and disappear. Eventually, in my unnerving nightmare, the fog would lift just enough to reveal a walking bridge and a little bald man in a trench-coat leaning against a wooden handrail. He was looking away from me into the mist. I walked up from behind the figure to stand at the handrail beside him and say hello. He recoiled in horror and shrieked! It was the figure in Edvard Munch’s painting The Scream! But instead of a scream, the creature emitted from its mouth the sound of a baby’s inconsolable cry. The nightmare would abruptly end with my eyes snapping wide open. I found myself dreading sleep in fear of that horrible nightmare. The fog, the sound of my father’s cough, the Munchly character on the bridge, the baby’s cry. On more than one night, I put off going into my bedroom. My bed became a rack. I knew exactly why this recurring nightmare haunted my sleep. By day, I could squelch the guilt of the abortion and willful abandoning of my own innocent offspring. But at night I drifted to the land of Nod. It was during the quiet rhythms of sleep in my dark bedroom that human defenses relaxed. Guilt would break through and I could hear blood of my child crying out from the ground. It was as though I bore the [M]ark of Cain. Although sleep disturbances after abortions are more common for post abortive women, they also happen to the fathers of the aborted children too. Despite this appalling internal haunting, I did not surrender to epiphany or a decisive moment of conscience—only the beginning of self-loathing. I slammed the book shut to bury the knowledge that I had participated in robbing a child of its life and rightful place in the world. I preferred the moral wasteland of the land of Nod and to be a ‘Mark’ of Cain. My drinking increased. This passage illustrates the awful effects of the Fall. First it severed man’s relationship with God, then it damaged man’s relationship with other humans. 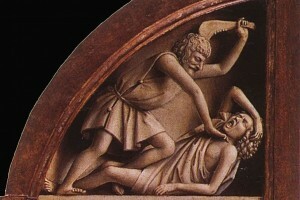 Murder was the monstrous way of Cain. It was monstrous in its deceit (“Let us go out in the field”). It was monstrous in its callousness, dishonesty and indifference (“I do not know, Am I my brother’s keeper?”). It was committed against a brother and a righteous man. Murder has been monstrous since the beginning. We do not know the geographic location of the land of Nod other than the Bible’s reference to it being “east of Eden.” The term Nod means “the land of nomads,” and that’s exactly what Cain became: a wanderer (Genesis 4.14), The Bible goes on to tell us, however, that Cain built the first city that he named Enoch after his son (verse 17). Does this mean that God’s penalty was being mitigated or another proof of Cain’s rebellious self-determination? The marks of God’s children are faith, hope, and love (1 Cor. 13:13; 1 Thess. 1:3–4). The marks of the devil’s seed are unbelief, despair, and hatred, and they are evident in Cain. Unbelief (1–7). When God killed animals and clothed Adam and Eve (3:21), He taught the significance of blood sacrifice (Heb. 9:22). Cain brought the wrong sacrifice in his hands and had the wrong attitude in his heart. His was not a sacrifice of faith, and God rejected it. God also warned Cain that sin was lying at his door, waiting to pounce on him. Hatred (8). Cain’s anger slowly became envy and hatred, and then it led to murder (Matt. 5:21–26). When you start to play with temptation, you will soon be caught (James 1:13–16). Cain was guilty of every sin that God hates (Prov. 6:16–19). Despair (9–24). God’s question to Adam and Eve was, “Where are you?” His question to Cain was, “Where is Abel your brother?” Do we know where our brothers and sisters are? Do we care? Or are we making excuses, as Cain did? In a sense, all Christians on earth live in exile, like a land of Nod. Our home is elsewhere. I was a ‘Mark’ of Cain (pun intended). The blood of the millions of innocents killed by abortion cry out to God, just as the blood of Abel still cried out from the ground. Their cries combine with a chorus of all innocent blood shed throughout history (c.f Revelation 6: 9-11). For those who stand culpable in shedding blood, those who joined the Marks of Cain, our only hope lies in Christ whose innocent blood mediates and speaks better to God (see Hebrews 12: 24). I believe the blood of millions of aborted children cry from the ground to God. Thomas Jefferson said, “Indeed, I tremble for my country when I reflect that God is Just.” Any reasonable patriot should tremble now. God will not be mocked. The beautiful TimeLife photographs haunted me, but so did Scripture. The Bible says the word of God is “living and effective, sharper than any two-edged sword, penetrating even between soul and spirit, joints and marrow, and able to discern reflections and thoughts of the heart.” The Word of God is like an all-seeing eye that probes and proves, validates or convicts the hearts and souls of people. One particular Psalm dogged me: Psalm 139. This Psalm was one of the readings at my father’s funeral. It speaks of God’s loving hand over all human life beginning in the womb. The unformed baby is immersed in the presence of the Almighty from the genesis and spark of new life. Victoria Day long weekend in Canadais a holiday commemorating Queen Victoria’s birthday (May 24th). That’s also my birthday. When I was a little boy, I thought the fireworks were to celebrate my birthday. My father let me believe it. Edvark Munch (1863-1944). Norwegian painter. Munch’s evocative and intense studies of psychological and emotional themes associated with anguish, isolation and death. Best known work is The Scream(1893), depicting a grotesque, ghostly figure experiencing pure terror. The Scream is considered an icon of existential anguish. 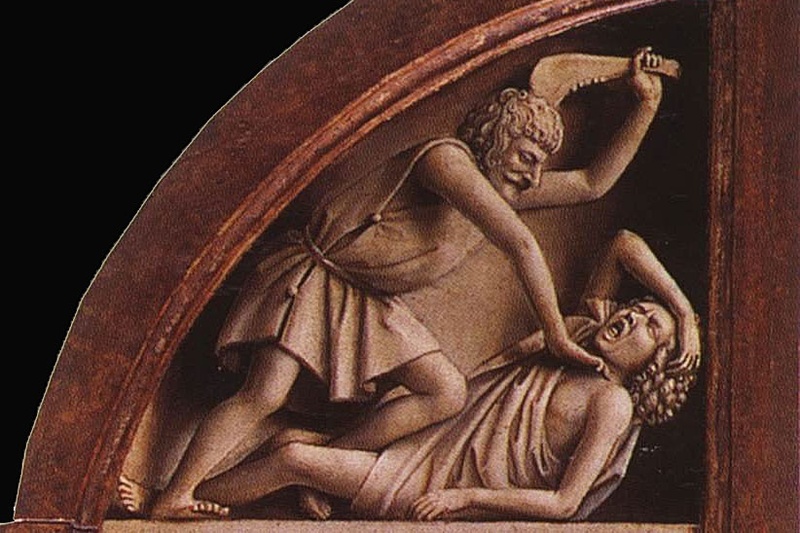 Many English writers have used the phrase ‘land of Nod’to signify sleep rather than the desolate land God banished Cain to after murdering Abel. The first recorded use of Nod to mean sleep can be traced back to Jonathon Swift’s 1738 publication of A Complete Collection of Genteel and Ingenious Conversation. “Sleep Disorders Increase After Abortion Says New Study”, Lifesite News, 25 January 2006, (http://www.lifesitenews.com/news/archive/ldn/2006/jan/06012502.) Accessed 14 June 2012. Also see: Also see “Women more likely to be treated for sleep problems after an induced abortion”, Medical News Today, 04 January 2006 . Wiersbe, W. W. 1997, c1991. With the word Bible commentary . Thomas Nelson: Nashville. Thomas Jefferson, Notes on Virginia (1784), Query xviii, Manners. Next Article Multi-Tools: What’s in Your Pocket? Mark’s writing hits like an avalanche. I too believe that the blood of the unborn “cries out from the soil.” The way forward for this country now is through consequences, repentance, and conversion of life. There is no escaping the judgment of God.